Samus's view through one of her Visors. A Visor is an interface system embedded into Samus's Power Suit. 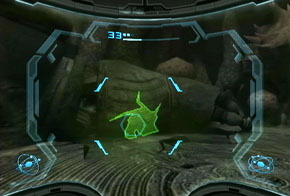 These visors are only seen in the Metroid Prime series, since it is suitable in the first-person environment. There are various types of visors, the standard of which is the Combat Visor. Others include the Scan Visor, the Thermal Visor, and the X-Ray Visor in Metroid Prime. Others include the Dark Visor and Echo Visor in Metroid Prime 2: Echoes. Similar to visors, but not referred to as such, is the X-Ray Scope, which allows Samus to see the composition of objects. This page was last edited on 10 April 2012, at 18:05. This page has been accessed 6,665 times.